A warm welcome to non smoking Apartments Hellweg - Tübingen.  Either our 4star 2 bedroom apartment located in Tübingen-Hagelloch - a Suburb of Tübingen on the edge of the Schönbuch forest, just 10 minutes drive from the city or our 1,5 bedroom apartment located in the hills of Tübingen's Westside right underneath the CRONA hospital. Both Flats were renovated in 2017, the 2 room flat has a separate bedroom, the smaller one has the sleeping area separated from the living area. Both units have free WLAN, Satellite TV, Bathroom with shower, outside seating area in the bigger one and a balcony in the smaller flat. Free parking is included in both units. Minimum stay is 3 nights. Please book in advance especially in high season. Numerous sidewalk cafes, wine taverns and cozy students' pubs, special shops, restaurants and taverns invite visitors to stroll around and to pause here and there. Taking a boat trip in a famous „Stocherkahn“ – the boat exclusive to Tübingen navigated by a long wooden pole – offers a scenic view of the picturesque Neckar waterfront with the famous Hölderlin Tower. No matter how long you stay in Tübingen, it's worth seeing the many attractions in the city and nearby. Tübingen is a wonderful University Town on the Neckar River and provides many opportunities for trips throughout the area. In the southern part of Tübingen is the village of Bebenhausen with its renowned monastery, which can be visited daily. On the border of Bebenhausen it is possible to visit the nature park, called "Schönbuch", encompassing more than 156 km² of woods. This is a wonderful place for a trip by bike. This nature park is the largest complete forest area in the whole of the Stuttgart region. Close to Tübingen is the "Swabian Alb", and the UNESCO Swabian Alb Biosphere Reserve where there are numerous sightseeing possibilities, such as castles ( Hohenzollern or Lichtenstein ), caves, ruins, waterfalls etc. Please ask at Tübingens Tourist Information for further details and information. Or have a look here ( in German ) or here ( in English ) finding some further links. Enjoy here the bird's eye view of the Hohentübingen Castle, the Hölderlin Tower and the Bebenhausen Monastery. ( Quelle: Tübingen.de ).